Whether you are planning to migrate to the cloud or already have applications there, you have the responsibility to secure your data and applications. There are a million reasons why the cloud can be the right move for your business, and the decision could be the catalyst for your organization’s explosive growth and performance. To benefit from everything the cloud has to offer AND maintain effective security, companies need functionality and pricing designed for the cloud. Barracuda Cloud Generation Firewalls are engineered specifically for this and will make your cloud migration seamless, faster, and more cost-effective. Don’t take it from us, hear from Club Automation, and their journey to AWS Cloud with Barracuda. 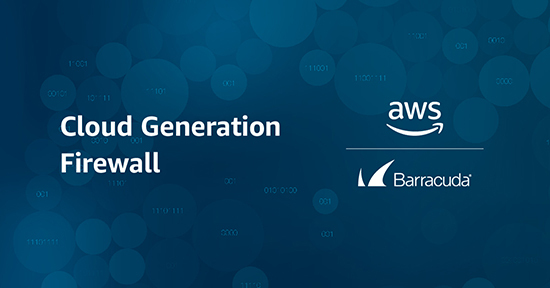 Learn about the benefits they are seeing, how they safely migrated applications to AWS, and are protecting their AWS deployment with Barracuda Cloud Generation Firewalls. Read the entire story here and learn more about how to safely leverage AWS Cloud for business growth!